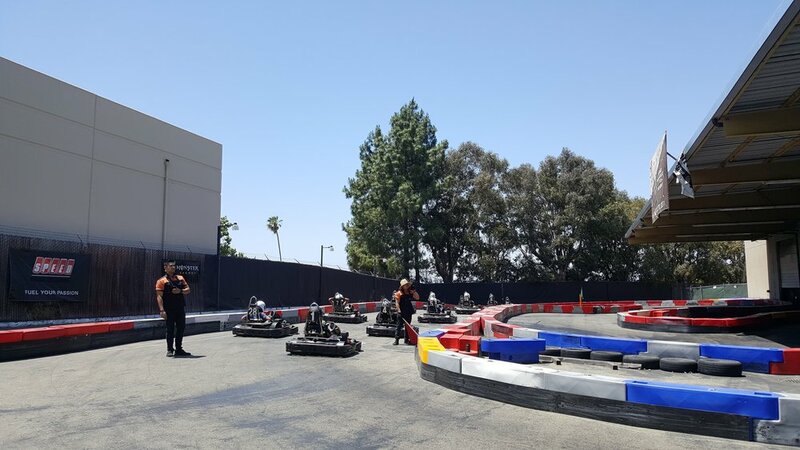 We had our first 2-hour Enduro Gokart Race this past weekend on May 27, 2017 at LeMans Karting in Fremont! It was my first time planning an event like this and definitely could have done things differently. But it all worked out and we had an amazing turnout. When we arrived, it was clear there was major miscommunication between me and their corporate party rep. They told me the reservation was just a 2-hour track rental, which meant we would do just a bunch of 10-min time trials. I actually had a mini heart attack, because everyone was there for a 2-hour enduro race, and they had their teams figured out already. There was no way I was going to tell a group of amped up racers, who paid for a full competition, that we were just going to do time trials for 2 hours. We went with catering through LeMans, which included the private room during the event. The room was already equipped with tables, chairs, and coolers filled with water and soda. Pizza and salad also arrived early, which was actually perfect because people were hungry throughout the race. Before everyone headed to the drivers' meeting, LeMans had to do a quick briefing with all the people who have never drove this track before. First, there was going to be a 20-minute qualifier. The actual race was 1 hour and 45 minutes. Every driver had to drive at least once. There must be a minimum of 3 pit stops / driver switches. The first driver in the race has to drive at least 5 laps before first pit stop. This is the fun part about enduro races. Every team had their own strategy. There were 41 drivers, broken down into 11 teams. Most teams had 4 drivers. With most of the participants being experienced trackday drivers and a couple professional racers and karters, I decided to sit this one out as I wasn't in the mood for a blood bath that day. We started with a 20 minute qualifier, which meant each driver, regardless of number of drivers per team, had 5 minutes each to get a fast time. Then we had a 10 minute break. The teams were able to talk more about their strategy now that each person has had a chance to drive the track and know what position they were starting the race with. First drivers of the race on the grid. The race was pretty intense and very long. Some minor crashes here and there. Couple spin-outs. No injuries though (other than bruised backs)! I had a couple people tell me it was too tiring. But I had a lot of people say they want to do this again. NOTE: Sorry my media coverage for this event was pretty poor. Jon and my brother bought me a beautiful new camera for my birthday and I was playing with it the night before. Yes, I left the SD card in the computer. So everything in this blog is from my terrible phone camera, except for Jon's gopro footage above.